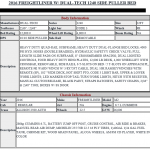 Texoma Trailer Body & Welding is your one stop wrecker bed solution. 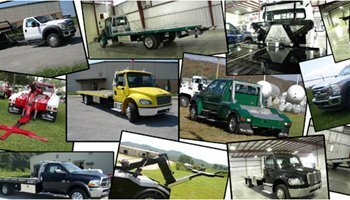 Our expert team is committed to providing the wrecker services and products you need. 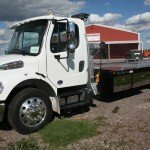 This includes carriers, tow beds, salvage beds, and transport beds. With us on your side, you can rest assured that your needs will be met with ease. All of our wreckers are high quality, low maintenance, and easily operated. Dual-Tech is one of our trusted wrecker product brands. 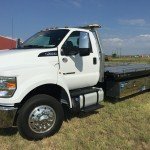 We have semi trucks with flatbed trailers and service truck with decks rated for 10,000 lbs. Dual-Tech also sells many parts, which are available at Texoma Trailer Body & Welding. These include alignment arrow decals, back up alarms, back up lights, control rods, grommets, handle clevises, hose socks, mud flaps, side rail inserts, and many other parts that are functional as well as accessories. From wear pads to hydraulic filters and everything in between, we have what you need to fix or enhance your wrecker. A wrecker is a type of tow truck used to move disabled, improperly parked, impounded, or otherwise indisposed motor vehicles. They often have a hook and chain attached to them to pull the vehicle out of an area or move it into a salvage yard. Wreckers are also used to crush cars that are to be recycled. We have a variety of wreckers available at our location. Rollbacks and carriers tow vehicles on a flat bed. 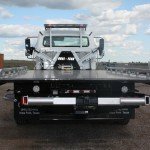 Rollback tow trucks are designed to gently roll a vehicle off the deck and onto the ground at a repair shop or salvage yard. 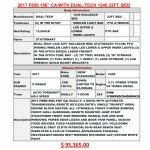 Just a few popular makes include Freightliner, Peterbilt, Ford, GMC, and Isuzu. 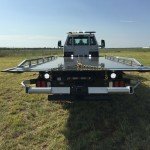 Rollbacks available from Texoma Trailer Body & Welding are able to transport multiple vehicles and haul varied loads. They also work efficiently in all towing situations to save you time and money. Specialty rollbacks are also available, designed with a deck height 5 inches lower to accommodate the transport of taller loads. Our experts will help you select the best rollback or carrier for your business.